Whether it’s a suspected forgery, a threatening letter or a questionable signature, investigators are always looking for the most effective methods of linking a questioned document to its author. Traditional physical and chemical analyses of inks, such as visual analysis or thin layer chromatography, are undoubtedly not ideal in dealing with the intricate differences in the vast variety of modern inks. But as analytical technology advances, scientists are able to study these samples at a more elemental level, allowing a greater ability to distinguish between different samples or conversely link them. The inks used in pens every day can vary in composition to a surprising extent, being oil, gel or liquid-based and containing various types and amounts of pigments and dyes, fillers, lubricants, surfactants (to reduce surface tension) and humectants (to prevent unwanted drying). To the naked eye the different inks used to write documents may seem utterly identical. However research has shown that with the right analytical tools in the scientist’s arsenal, it is possible to not only distinguish between inks produced by different manufacturers, but also potentially differentiate between batches produced by the same manufacturer but simply at different times. A vast range of analytical instrumentation can allow scientists to achieve a colossal collection of things, one of these technique being Raman spectroscopy. Let’s have a brief look into how this technique works, and what it could possibly have to do with ink. 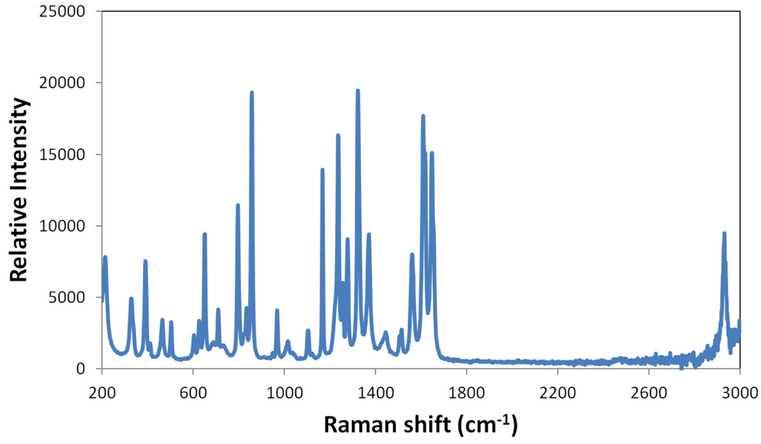 Raman spectroscopy is a non-destructive, analytical technique based on the scattering of monochromatic light. Two types of scattering can occur. Primarily this is elastic scattering known as Rayleigh scattering (it is this that is responsible for the blue colour of the sky). But that isn’t what we’re interested in here. When light encounters particles in the air, there is an exchange of energy between the photon and the molecule, and a scattering of light can occur in which the photon has either a higher or lower energy than the incident photon. Inelastic scattering, known as Raman scattering, is the basis of Raman spectroscopy. The loss or gain of energy during the interaction is referred to as Stokes and Anti-Stokes respectively. The emitted photon can provide information regarding the molecular structure of the sample. An excitation source, typically a laser, directs a beam over the sample, scattered light is then collected with a lens through some form of wavelength selector and a detector, and a Raman spectrum of the sample is obtained. Using this spectrum, it may be possible to differentiate between different substances. So how can this be applied to ink analysis? The ability to distinguish between seemingly identical ink samples could play a big part in tracing the ink used to write a document, determining if two documents were written using the same ink, and even helping to establish how long ago a document may have been produced based on when that particular batch of ink was produced. And that is exactly what Raman spectroscopy (and various other techniques) is aiming to achieve. The research examining inks for purposes of forensic document examination is plentiful. The study under discussion here subjected a wide variety of pen inks to Raman spectroscopy, including pens from different companies, different models from within the same company, and different batches of the same brand and model. The results were promising. Oil-based pen inks were typically very similar, making it difficult to distinguish between different samples. However gel and liquid-based inks were quite a different story, containing such a range of components that the Raman spectral signatures could be used to distinguish between samples. It is one accomplishment to separate the inks produced by different manufacturers, but the use of Raman analysis has even succeeded in distinguishing between inks of the same manufacturer simply produced at different times. Small spectral differences in different batches of the same brand showed slight changes in the chemical composition of the ink over a number of years. These changes in the makeup of the same ink over time could be due to a wide range of factors – manufacturers changing to a different supplier of a particular dye, fluctuations in temperature and other variables during manufacture, and even slight errors during production. Of course the work does not necessarily take into account the fact that thousands of pens produced using the same batch of ink will most likely produce identical Raman spectra or how ink compositions might change over time through various effects, but it’s certainly an interesting application that could prove useful. Braz, A et al. Studying the variability in the Raman signature of writing pen inks. Forensic Sci. Int. 2014 (245), pp. 38-44.